Seneit Debese founded the Greta & Starks apps which are designed to be the one solution for film reception for people with no or low vision, for hard of hearing and deaf individuals and for an international audience – 813 million people worldwide! The idea is to create a unity of humanity that transcends borders, especially for the physically disabled. This idea allows those affected a more independent life and better integration into society. She believes that we all are role models and that we only need to start acting accordingly. Come and share the adventure of Seneit Debese’s journey to success. Discover the highs and lows she has been through in establishing and then managing a profitable business that offers an invaluable service to people less fortunate than ourselves. 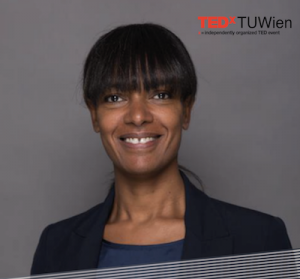 Don’t miss a chance to listen to her story on the stage of TEDxTUWien.